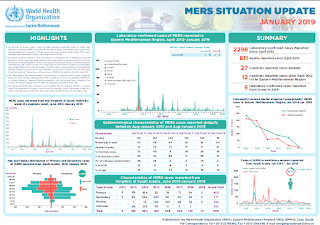 After three months (Oct-Nov-Dec) where the number of monthly MERS cases reported world-wide never exceeded single digits, in January we began to see an uptick in activity in Saudi Arabia (n=14) and in neighboring Oman (n=5). In just the first 10 days of February, we've seen an even greater increase, with 29 additional cases reported from Saudi Arabia, primarily from 3 clusters in Wadi Aldwasir. The World Health Organization's Eastern Mediterranean Regional Office (EMRO) has published their latest (January 2019) MERS summary - and while very brief - it does provide us with a bit more insight into the Oman cluster (5 cases and 2 deaths). First the report, then I'll return with a few notes. At the end of January 2019, a total of 2298 laboratory-confirmed cases of Middle East respiratory syndrome (MERS), including 811 associated deaths (case–fatality rate: 35.2%) were reported globally; the majority of these cases were reported from Saudi Arabia (1915 cases, including 735 related deaths with a case–fatality rate of 38.3%). During the month of January, a total of 19 laboratory-confirmed cases of MERS were reported globally; 14 of the cases were reported from Saudi Arabia with 3 associated deaths and 5 from Oman with 2 associated deaths. Of the cases reported from Saudi Arabia, 3 household clusters were reported with a total of 8 cases. The cluster reported from Oman included 5 young females (age range 30-59) living in the same region. Of these cases, 4 were secondary cases, identified through contact tracing of the 1st case detected on the 24th of January. Prior to this event, Oman has reported 11 laboratory-confirmed cases of MERS-CoV infection to WHO since 2012. The demographic and epidemiological characteristics of reported cases, when compared during the same corresponding period of 2013 to 2019, do not show any significant difference or change. Owing to improved infection prevention and control practices in hospitals, the number of hospital-acquired cases of MERS has dropped significantly since 2015. While sparse, this report provides the first hint of what transpired with the Oman cluster, although it leaves a number of questions unanswered. The four secondary cases lived in `the region', but apparently not under the same roof, and there is no mention of the the type of epidemiological links between the index case and secondary cases. And lastly, since the cut off date for this report is January 31st, we don't know if this cluster was limited to the 5 cases mentioned. As of last August, the ECDC's list of confirmed MERS cases showed a total of 11 cases from Oman. Add today's 4 new cases, and that number should jump to 15. But today's announcement cites 18. 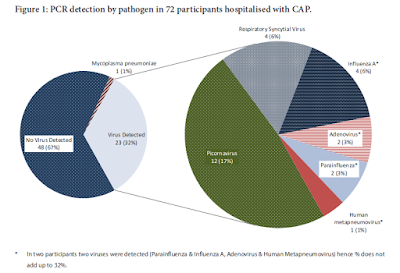 Today's EMRO report clearly states: Prior to this event, Oman has reported 11 laboratory-confirmed cases of MERS-CoV infection to WHO since 2012. Discrepancies in case counts are nothing new, and perhaps it was simply a typo by the MOH. But at least we now know we didn't somehow miss 3 cases reported sometime since the last case I blogged on in March of 2018. Obviously there are a number of gaps to be filled in. Hopefully the WHO will issue a more detailed DON report in the days to come.